Which are these NGOs, where are they based and what do they do? In October, the ministry of home affairs (MHA) sent notices citing violations to 10,307 non-governmental organizations (NGOs) out of the 40,139 registered under the Foreign Contribution (Regulation) Act, 2010 (FCRA). The notices indicated that the NGOs hadn’t filed annual returns for the years 2009-10, 2010-2011 and 2011-12. This April, according to an MHA communication, 8,975 NGOs were deemed ineligible to receive foreign funds and their licences suspended. Which are these NGOs, where are they based and what do they do? Is the MHA targeting certain non-profits because their work is rights-based, advocacy-related or have a religious agenda? Granular data for all 8,975 NGOs was not available. We were able to match 7,936 NGOs on the MHA’s website. Here’s a break-up. Non-profits with a licence to receive funding under FCRA must self-classify based on their primary activity. An NGO can list more than one activity, but we have taken into account the first listed. The five categories are social, cultural, religious, educational and economic. Only 28% of NGOs listed their primary activity as “economic" or “educational". “Cultural" was listed by 24%, while 28% cited “social" as their primary activity. Is there a targeting of NGOs based on their activity? 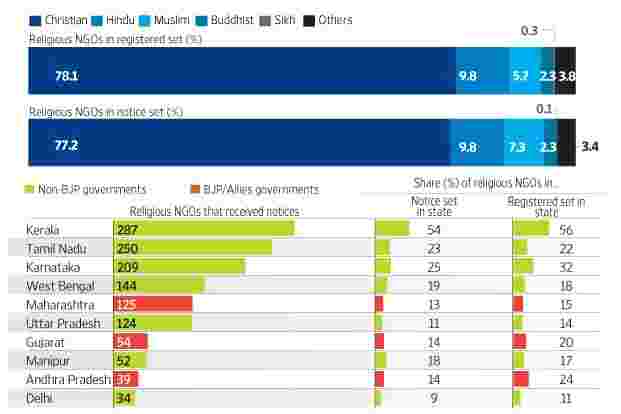 An analysis suggests otherwise: “religious" NGOs account for 18% of notices received, but the category itself accounts for 21% of NGOs listed under FCRA. It’s only in the “social" category that the notices received exceeded their overall share. Fifteen states and Union territories accounted for 93% of the 40,139 NGOs with FCRA registration. Tamil Nadu has the maximum number of NGOs, followed by Maharashtra and Andhra Pradesh. NGOs with FCRA registration from 24 states received notices. These can be divided into two categories: states whose share of notices exceeded their share in the total registered pie (depicted as a “positive differential" in the graphic below). For example, Uttar Pradesh, a non-BJP ruled state, accounts for 7.9% of all FCRA-registered NGOs in India, but it received 14% of all notices, resulting in a positive differential of 6.1 percentage points. There are nine such states, and eight of them have non-BJP governments. In the second category are the 14 states whose share of notices was lower than their share in the overall FCRA pie—a negative differential. The BJP or its allies were in power in eight of them. 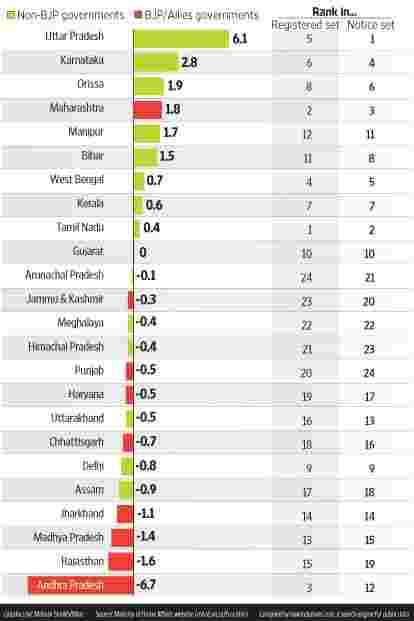 Gujarat has a zero differential. In their disclosures to the MHA, NGOs also need to indicate their faith if their listed activity is religion. About 78% of all religious NGOs that receive funding are Christian, which is about the same percentage as the religious NGOs who received notices from the MHA. In this set, only NGOs that follow Islam received notices in excess of their overall share. Further, among the top 10 states by notices to religious NGOs, there was no difference in the number of NGOs registered and notices received. 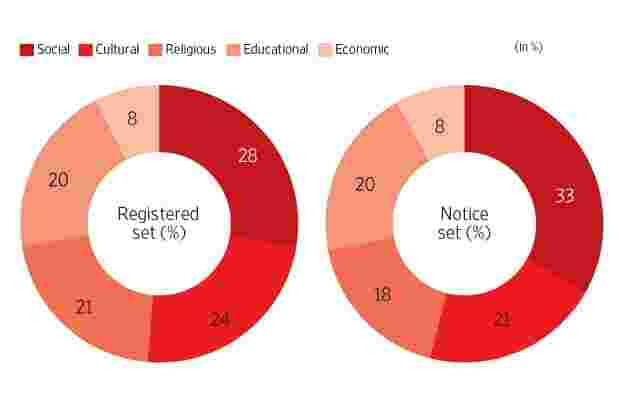 For NGOs classified as religious, economic, educational and cultural, the notices sent were largely in line with overall figures (see “By Activity" graphic). 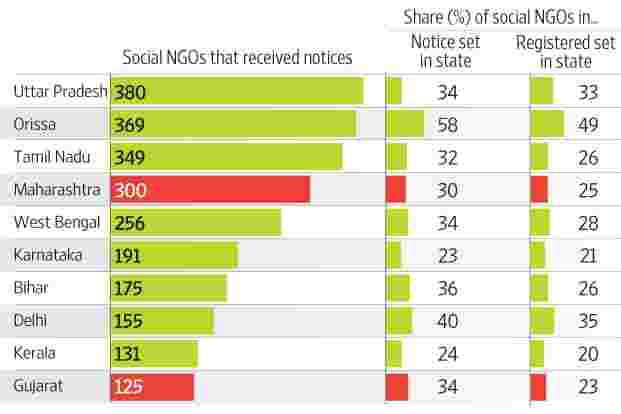 It’s primarily the “social" NGOs that saw a larger percentage of NGOs receiving notices compared with their presence in their respective states.